As a former journalist, accredited business communicator, published author, entrepreneur, and passionate follower of technological change, Alexandra Edmiston brings a unique perspective to writing. A graduate of Ryerson’s specialized two-year journalism program for university graduates (JRAD), Alexandra also holds a degree in psychology from the University of Windsor and a self-employment development certificate from Centennial College’s Centre for Entrepreneurship and a digital marketing certificate from the University of Toronto. 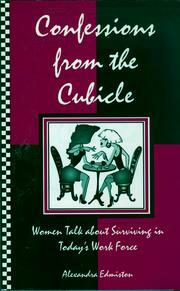 Confessions from the Cubicle – a primer for young women entering the work world - is her first book. It was profiled on CBC Radio’s Later the Same Day, TVO and on the CTV morning shows in Toronto and Montreal. Her writing has also appeared in the Globe and Mail, the Toronto Star, Marketing Magazine and CBC Radio. Are you sure you want to remove Alexandra Edmiston from your list?